Art Rooney, the putty-faced, cigar-chomping, founder of the Pittsburgh Steelers, known to all as "The Chief," was many things in his long and colorful life - a gambler, boxer, ballplayer, horse-breeder, and football man to his core. But none of that speaks to his nature. This does. Rooney never wavered from his insistence that his head coach called the shots, and when Coach Walter Kiesling decided to cut a skinny kid named Johnny Unitas before the start of the 1954 season, Rooney reluctantly agreed to drop the locally-grown quarterback over the strong objection of his own sons. Some weeks later, driving through town, Rooney - with Kiesling beside him - happened to pull up beside Unitas. Rooney asked Kiesling to roll down the window, then leaned across his coach. "Johnny," Rooney yelled, "I hope you become the greatest quarterback in football." Other owners might have said it, but Rooney actually meant it. "He was a man who belonged to the entire world of sports," observed NFL Commissioner Pete Rozelle when Rooney died in 1988. "It is questionable whether any sports figure was more universally loved and respected." The eldest of nine children, Arthur Joseph Rooney was born in Coultersville, east of Pittsburgh, on January 27, 1901, to parents forged by coal and steel. His father, Dan, came from a line of steelworkers, and the men in his mother Margaret's family toiled in the mines. When Rooney was two, his father relocated the family to an apartment above the saloon he ran in a tough neighborhood near Exposition Park, home of the Pirates. 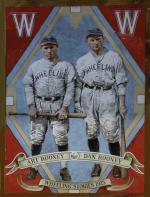 Art and Dan Rooney in their Wheeling Stogies uniforms, 1925. Never a big guy - only 5-foot-7 - he stood out from the crowd by high school, defined as much by his shock of red hair as by his superb athletism. In sports, Rooney found the ticket that would keep him out of the mines and the mills, though never out of the neighborhood he chose to call home; throughout his adult life he lived across the street from the house he grew up in. "Why should I move?" he once asked a reporter. "I'm a Pittsburgh guy." He starred in both baseball and football at Duquesne Prep, then opted to play baseball at Georgetown over football for Knute Rockne at Notre Dame, before returning to Pittsburgh to shine in both sports at Duquesne. A superb boxer, he fought his way in 1920 to national amateur titles in the welterweight and middleweight divisions, and a spot on the U.S. Olympic team. He pitched several seasons of minor league baseball until arm trouble put him on the shelf in 1925. He also played football, and from 1926-1932 was owner of a string of semi-pro teams in the area. In 1928, he added boxing promoter to his resume, and, two years later, parlayed his love of the track into an interest in breeding racehorses, which he would continue to dabble in for the rest of his life. In 1933, Rooney took $2,500 he had won at the track and bought what would become the National Football League's fifth franchise. He named his team the Pirates, which, like their baseball counterparts, played home games at Forbes Field. 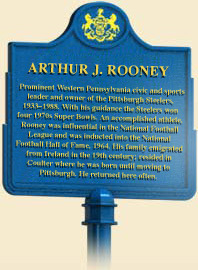 In 1940, Rooney renamed them the Steelers, an homage to the industry synonymous with the city, in hopes that his team would find an identity of its own. It did - as losers. Year after year, the Steelers fumbled and stumbled. Even when the team merged with Bert Bell's Philadelphia Eagles during World War II to form the Steagles, Rooney moaned that "Even though they've got new uniforms, they look like the same old Steelers to me." And in the fan's eyes, that's just what they were, and what they would remain into the 1970s, the Same Old Steelers - "SOS." Yet, as bad as the teams generally were, Rooney never gave up on them. In their first seasons, he regularly covered his payroll with winnings from the track, finally assuring the franchise's survival - and his own solvency - over one amazing weekend in the summer of 1937. Still, money - which he willingly gave away to support a variety of civic causes - never seemed as important to Rooney as sportsmanship, honor, and decency. For decades, he kept the team's ledger in his own personal notebook, preferred handshakes to contracts, and - taking a page from Pirate owner Barney Dreyfuss's book - built a reputation for paying and treating his players well. After every loss, he would rush to the locker room to console his players. Out of respect, they would always stand up when he walked into the room. Football fortune finally smiled on Rooney in 1969. By then, his oldest two sons, Dan and Art, Jr., were working for the team, and when their father began looking for a new coach, they advised him "to put friendship on the bottom of the list." He did, and chose a field general he had no ties to: Chuck Noll. Noll proceeded to win his first game at the helm, then - SOS - lose the next thirteen. But Rooney stuck with him, and Noll went on to build a juggernaut around quarterback Terry Bradshaw, running back Franco Harris, wide receivers Lynn Swann and John Stallworth, and a defensive "Steel Curtain" led by Mean Joe Green up front, linebackers Jack Ham and Jack Lambert, and cornerback Mel Blount. The Steelers, which had never won a championship, were suddenly a dynasty. One of the greatest teams in NFL history, they twice put together back-to-back Super Bowl titles, in 1975 and 1976, and again in 1979 and 1980. Noll, Bradshaw, Harris, Swann, Stallworth, Green, Ham, Lambert, Blount, and center Mike Webster would all earn their niches in the Pro Football Hall of Fame. As would Art Rooney, who remained the team's chairman until the end. In August of 1988, Rooney, now eighty-seven, suffered a stroke in his office at Three Rivers Stadium, then died eight days later in Pittsburgh's Mercy Hospital. "He was a very humble person," recalled Bradshaw at the time. "Losing or winning, he was no different." The observation would have pleased The Chief very much. Bill Chastain, Steel Dynasty: The Team That Changed the NFL (Chicago: Triumph Books), 2005. Andrew O'Toole, Smiling Irish Eyes: Art Rooney and the Pittsburgh Steelers (Haworth, NJ: Saint Johann Press), 2004.